When I first moved to Chicago and friends wanted to visit, they drooled and grovelled to go to restaurants like Planet Hollywood, Hard Rock Cafe, Michael Jordan’s Restaurant, Harry Caray’s, and the Rock-n-Roll McDonald’s. During those moments when the requests came forth, I mumbled silently to myself, “Lord, deliver me from such lack of exposure to the finer things in life.” And now I look back on it all and realize that I have been a food snob for a very, very long time. As one grows older, there is more exposure to the global community — one would think — and with that there should be more of an interest in indulging in something that reflects a bit of refinement in your culinary delights. Several months had passed since I got a chance to catch up with Wongchana, one of my very great friends from Phucket, Thailand. He owning and managing two Thai restaurants in Chicago, one in Hyde Park and one in Lincoln Park. Me busy with work during the day and engaged in constant photography after work. There comes a time when you admit that you have to make time for things that matter and good food is at the top of our list. So Wong and I decided that it was time for us to have a face-to-face to discuss travels and politics. We made our meeting ground one of the best authentic Japanese restaurants in the Chicago area. 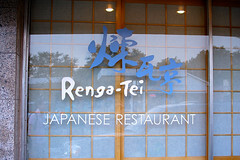 Renga-Tei at 3956 W. Touhy Avenue in Lincolnwood was the watering hole. Even upon walking through the door, the waitresses greeted us with limited English. Lucky for me, a little bit of my Japanese was still intact, which made for giddy giggling from the waitresses and special treatment from the sushi bar. A Black man speaking Japanese? What? Throughout the restaurant were other Japanese working their chopsticks and slurping on miso soup, the absolute indication of authenticity. And once we had bowls of miso soup placed in front of us, we too understood why the slurping was so loud and constant. 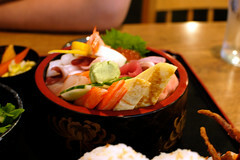 At many Japanese restaurants, the portions are small such that they are mostly appetizer-style as opposed to entrée-sized. Renga-Tei is not one of those dainty Japanese restaurants that boasts aesthetics. No, they aim to satisfy the palate and they hit the mark every time. My friend ordered a seafood salad served over rice. Filled with shrimp, sweet eggs, yellowtail fish, caviar, and a few other seafood bites, this was a rather colourful bowl of amazement that makes the taste buds pop. No belly would growl for more after indulging in so many morsels from the bowl. I ordered an unagi avocado maki just to keep things exotic. The slippery eel that you see swimming in the water at aquariums or in the water on your television set may not be appetizing to you at a glance. But wrapped in seaweed and rice, it is delightful. 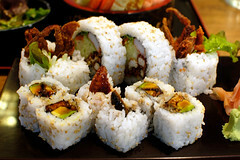 I also ordered a dragon roll, which was soft shell crab done up nicely before I devoured it like an angry bear. Many Japanese restaurants, especially the chic-chic ones that boasts on cosmetics filled with paper dolls and coiffed Abercrombie men, prepare small, manageable dragon rolls. Not Renga-Tei. These maki rolls are what make the dining experience worth while. And I grabbed the pieces with my chopsticks and expressed my love for the delicacies after dipping them in soy sauce filled with wasabi. No Japanese meal is complete without a cup of tea. And I do not mean Lipton, Nestea, Arizona green tea, or any placebo in a tea bag. The tea at Renga-Tei may be slightly reminiscent of drinking brewed freshly cut lawn grass. Beer may be an acquired taste — and a good way to get a gut that you cannot rid yourself of without intense sit-ups or liposuction. But green tea at Renga-Tei is an acquired taste that will not only go great with your meal but also lower your blood pressure and stress level. The fact that the tea was bottomless made the whole dining true to what you get when you are in Japan. This was the second time that my friend and I had been to Renga-Tei. However, the dining experience seemed slightly new this time around. Could it be because we had tried something different that we had not had before? Could it be because we had incredible appetites and the food this time was so damn good, albeit no more appetizing that it was the first time we went? Could it be because we got something extra from the sushi bar that did not end up on the final bill? Hmmm. I cannot put my finger on it, but there will be multiple other times that this particular Japanese restaurant will be a stopping ground for some genuine food from the Far East. All these other “performance” restaurants that have a Japanese feel to them? Give me a break.